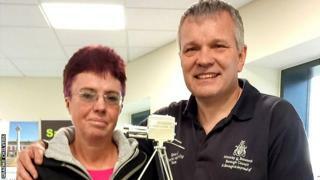 Graeme Chilvers (right, with 2017 Unsung Hero winner Denise Larrad) has nominated three national Unsung Hero award winnersDenise Shannon has had quite a year since being named 2017 BBC Get Inspired Unsung Hero at the BBC Sports Personality of the Year show in Liverpool.But it might have been a very different year - were it not for Graeme Chilvers.He's the man who nominated Denise in the first place. cascade trainer[/i]' for Walking for Health[/i]," says Graeme, who has himself always been involved in sports coaching. "I trained Denise up to be a walk leader. "And Graeme is passionate about the importance of sport and fitness for everyone. "You see the impact, especially with young people and their education," he says. "Teachers say young people involved in sport have a better attitude to life. They focus more and work their way through problems and get success. "won in 2012 (after being nominated by Graeme), helped to build the Sport in Desford leisure centre, which this year won the Disability Programme of the Year at the British Tennis Awards. [/i]The impetus is something Denise already acknowledges. "Winning the award has given me confidence in what I am doing and made me realise that I am making a real difference," she says. So Graeme would urge you to nominate someone for the award. "Sport in this country wouldn't happen without these volunteers," he says. "It's a fantastic way to acknowledge and thank them for the work they do. "Find out how to nominate someone for the 2018 BBC Unsung Hero award here.